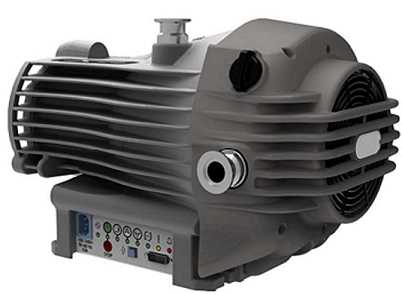 With exceptional pumping capability, ultimate vacuum performance and state-of-the-art design features, the nXDS dry scroll pump is the best performing pump in its class. nXDS improves on the original XDS pump technology by offering increased pumping speeds, combined with lower ultimate pressures, low power consumption and reduced noise. The gas ballast allows for pumping of condensable vapours, including water, solvents, dilute acids and bases. nXDS pumps feature the very latest in tip seal technology, giving a significantly longer life between tip seal changes. nXDS-C has been modified so that it is more suitable for use on vapour handling processes and may be used in some applications involving corrosive substances. This chemically resistant version is fitted with Chemraz® internal valves and stainless steel fittings. nXDS-R has the gas ballast blanked off so it cannot be accidently opened. This is useful for applications such as rare gas recirculation or gas recovery. Lubricant-free: within the vacuum envelope and hermetically sealed means a totally clean and dry vacuum to prevent cross contamination. Advanced scroll-form and tip-seal technologies: deliver best‑in-class vacuum performance and unrivalled ultimate vacuum levels. Unique tip seal design: significantly reduces wear to minimise maintenance and extend service life. Quiet operation: with typical noise during operation < 52 dB(A) for minimal environmental impact. Advanced interface: providing a variety of traditional and analogue and digital control methods enabling remote control/monitoring via RS232 or RS485. Integrated inverter drive: with auto sensing input delivers optimised pumping performance globally.